The NBA is a copycat league, as Paul George described after the Thunder’s loss on Tuesday to the Atlanta Hawks. Though the personnel and precise tactics will be different, George’s proclamation was prescient, given the Thunder’s upcoming opponent – the Los Angeles Lakers. Both the Hawks and Lakers are in the top three in the NBA in pace, top five in points in the paint, and rank number one and two in field goals attempted in the restricted area. If there was ever a prime chance for the Thunder to get right in the areas where it struggled in its last game, Thursday’s battle with the Lakers will provide the perfect test to see how the Thunder can protect the rim. With playmakers like Lonzo Ball and Brandon Ingram along with roll men in the form of Kyle Kuzma and JaVale McGee, the Lakers will aggressively attack the Thunder all night. For the Thunder’s defensive integrity to hold up, as it has done nearly all season long to earn the team a tie for the best defensive rating in the league, the team has to be precise in the most important aspect of any defense – the pick and roll. Against the Hawks, the Thunder got strung out along the perimeter, Atlanta’s guards were able to linger in the lane and pick out lobs to the rim or shooters in the corner. The unique aspect of the Thunder’s defense, in comparison to most teams in the league, is the prevalence of being “up” in pick and roll coverage, meaning that centers Steven Adams and Nerlens Noel rush up to the point of the screen to deny the ballhandler an easy three-point shot or a drive into the lane. It’s a temporary double team, focused on slowing down the most important thing on every possession: the ball. When the Thunder’s defensive strategy is being executed at a high level, off-the-dribble three-pointers from an ever-increasing number of marksmen at the guard position can be eliminated. Same with the corner three-pointers that every team is trying to create. So far this season, the Thunder ranks 9th in opponent three-point percentage out of the corner. The key to it all is the initial dynamic between the Thunder’s center and guard in the pick and roll itself, and then the off-ball defenders being in the correct help-side positions to deter rolls to the rim or spray out passes to the corner. “The faster the guard can get back on front, and I can get back out on my guy, the window of opportunity for them will shorten which is more ideal,” said Adams. Defending the pick and roll is something the Thunder may have to do upwards of 100 times in Thursday’s game against the Lakers. While making shots, hitting free throws and rebounding are all critical, there may not be any one aspect of the game that the Thunder has to execute on with more frequency against the Lakers. With an internal fire burning after losing on the road, the Thunder is ready to get back to action, and come away with a home win. -Alex Abrines (personal) and Nerlens Noel (concussion protocol) both participated in the non-contact portions of practice today as the team mostly watched film and then did some skill work and shooting in position groups.UPDATE: Nerlens Noel passed all the stages of the concussion protocol and will be available for the Thunder tonight against the Lakers. 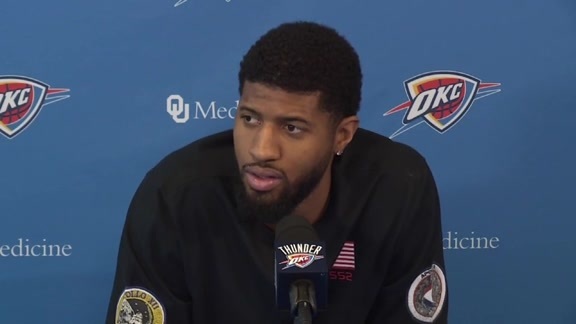 - At shootaround on Thursday morning, George explained another layer to the Thunder’s continued growth in its pick and roll coverages. Many times the low defender on the back side of the play, often a forward or guard down near block, will have to make the choice between crashing in to help on a big man rolling to the rim or sticking with a three-point shooter on the wing. Typically, opponents slot that shooter in the corner, but lately they have been having that player re-locate up above the break at the three-point line. That adds an extra few feet to close out and another wrinkle to consider. - So much of the conversation about the Thunder has revolved around defense the last few days, but over the last four games, including one double-overtime contest, the Thunder is averaging 128 points per game. In order to get the job done against the Lakers the Thunder will need to be strong offensively to go with its defensive focus heading into the game. “Stay disciplined with getting a good shot every possession and just keep attacking them,” said George of the gameplan.